Maddie O’Laire is a wife, mother and fisherman. 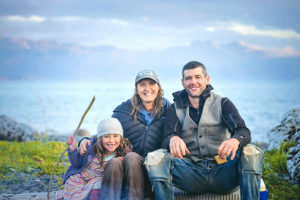 The Dallas, Texas native first heard about “the most beautiful place in the world”– Homer, Alaska– from an American family she met while teaching and traveling through South Asia. After Maddie finished her teaching program in 2010, she got on a flight for another exciting adventure to see exactly what the family was talking about. She hasn’t left Alaska since. Maddie and her husband, Mike, live in Homer and run all operations of their fishing company, Smartsource Seafood out of Bristol Bay. 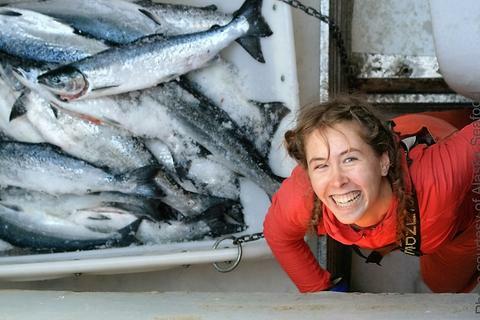 Alaska Seafood Marketing Institute (ASMI) was able to sit down with Maddie for an interview about her life as a sustainable seafood fisherman in Alaska. ASMI: Can you tell me a bit about your background – location, job, family? Maddie: I grew up in Dallas, Texas and moved to Alaska in 2010. I met a couple Alaskans from Homer while I was backpacking in Nepal. They sold me on Homer and invited me to visit. I booked a one-way ticket and was sold on day three. I run a direct-market seafood business and occasionally commercial fish with my husband, Mike in Bristol Bay. We have two kids – Iris (11) and Owen (1). We live in Homer with 8 ducks, 6 chickens, 2 geese, and a 1000 square foot greenhouse. ASMI: What made you become a fisherman? Maddie: Fishing works for our family because we love being out in the wild, and we enjoy adventuring in the winter. We have an “all or nothing” mindset, which works well for fishing Bristol Bay. ASMI: Do you work for yourself? If so – can you tell us why you set up your own business? Maddie: Yes! We live in Homer, and there’s not a lot of great job opportunities here. I wanted to be able to stay home with our kids and do something I’m really passionate about. I’ve always been interested in healthy eating and living, plus Mike commercial fishes, so selling fish was a natural fit. Whenever I would go back to Texas, people would ask for salmon. We’d bring some with us on every trip and our friends and family were crazy about it. So, we started selling directly to a small group of friends. Word of mouth spread quickly and now we ship our fish all over the Lower 48. ASMI: Can you describe a typical day out on the water? Hours? Maddie: When I am out, we’re fishing or preparing to fish around 16 hours a day, if not 24 hours. Bristol Bay is fast and furious. ASMI: During the summer season when you are constantly out on the water, how do you balance the pressures and demands of work with raising a family? Maddie: Since we had our son I haven’t been fishing, which is hard because I’m away from Mike for a lot of the summer. We go back and forth about joining him on the boat, but Owen is just starting to stand, and I think having a one year old on a 32-foot boat would be especially challenging. Mike struggles with missing Owen and Iris a lot. Children grow up so fast and he’s missing things like swim lessons and birthday parties, which is really tough. ASMI: How do you manage with the different seasonal demands? What do you do throughout the winter period? Maddie: We relax and play A LOT in the off season. Direct marketing has worked well for us because I’m able to do it from home during the winter months. During the winter, we have a lot of long mornings with big breakfasts and lots of coffee and we cross country ski almost every day. We spend a lot of time as a family. Snowy weekday mornings spent in our PJs until 11am make the grueling summer months’ worth it. ASMI: What do you love about the job? Maddie: The flexibility and providing a product that people absolutely love. Many of our customers come from landlocked states and they’re convinced they don’t like fish because everything they can get where they live is fishy. When they try our salmon, they love it. There are a lot of older people who are advised by doctors to eat more seafood and it’s a real struggle for them until they try really great, clean fish. It’s very rewarding to know our fish is helping people feel better. ASMI: What’s been your biggest challenge? Maddie: Logistics! Direct marketing fish from Bristol Bay is a bit of a logistical nightmare. We’ve been in business for five years and it’s taken a lot of trial and error to get where we are today. Mike would also say that I work too hard. So, that’s a challenge for us. Direct marketing is not easy! ASMI: Has there ever been a time when you thought that you couldn’t cope as a woman in the fishing business? Maddie: In the beginning, I never felt like people took me seriously because I didn’t know the “lingo” and I really didn’t know much about fishing at all, coming from Texas. I sometimes look back at old emails and laugh. I really didn’t have any idea what I was talking about, but I’ve learned a lot over the years. Doesn’t stop me feeling goofy sometimes. ASMI: Would you recommend it as a career choice for other women? What advice would you give? Maddie: I would, especially for those wanting to raise a family. The flexibility is really nice. For direct marketing, I would suggest taking classes in business or marketing. I have a degree in both, which has helped tremendously. It also helps to have two or three people helping you out. For us, it really helps that I’m land-based when Mike is fishing. I think having a partnership like that is really ideal. I’m very supportive of people wanting to direct market and do believe the more people doing it, the better for all of us. But, expect a lot of work. To learn more about Alaska’s sustainable seafood industry, check out our fact sheet!